It’s rare that an experience changes your perception of a sport and despite the pain and ebbing fatigue, leaves you completely revitalised. 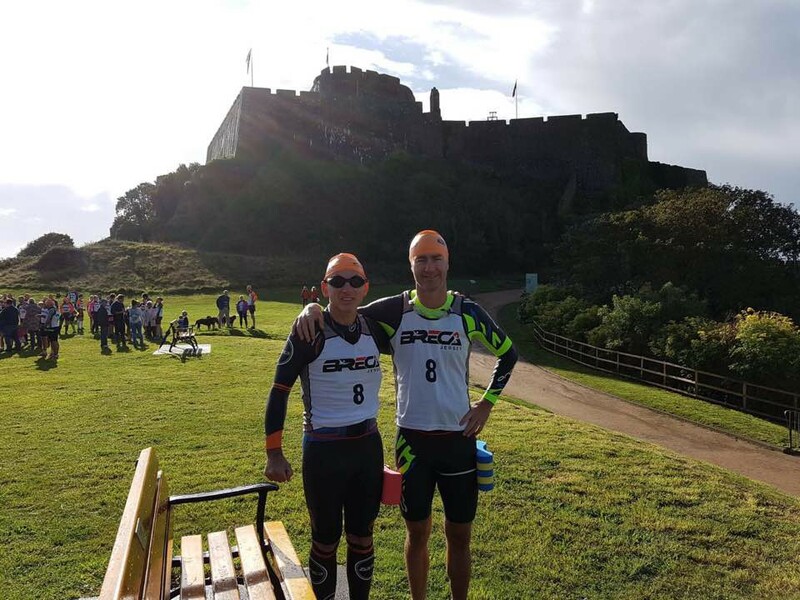 Without being too melodramatic, that is exactly what happened in our first experience of Swimrun at the Breca Jersey event this last weekend. Swimrun is a relatively new discipline born of the modern urge to invent increasingly innovative and challenging endurance events. It is a series of run and swim sections staged continuously as a race in rugged environments, normally held over “ultra” scale distances. You run in your wetsuit, and you swim in your shoes. The emphasis is on teamwork, with the race run in pairs, athletes tethering themselves together during the swim, and sometimes during the run sections to help each other along. There is a sense of the natural and the raw — the event is in a sense ‘unpasteurised’, less sterile and distinctly less regulated than its more mature cousin, triathlon. Swimrun upholds a love of the natural beauty of the environment, and an overwhelming urge to embrace this and all the hazards that come with it. It is everything you wanted to be able to do as kid, but your mum wouldn’t let you. Competing as a team in pairs rather than the intense solitude normally brought by other endurance events brings a new energy to the Swimrun discipline. Individuals are not racing just for themselves, but instead enter a shared contract with another. Each athlete ranks equally in the completion of the task. Both have trained hard to address the stiff challenges they know will lie ahead. Completion depends as much on the other person as themselves, and the race is over for both if either should capitulate. Individual strengths are therefore used to help and support the task — the pair are genuinely there for each other. In other words, the sport is a foundation for truly authentic partnership, and engenders an ethos that is obviously grounded in teamwork and camaraderie. It is a refreshing competitive arena. The scale of the challenge faced in Swimrun is right up there with the toughest single day endurance events. Set amongst the rugged scenery and spectacular natural beauty of Jersey, our first taste of Swimrun courtesy of Breca, encompassed 54km of the coastal trail — 47km by land, embracing nearly 1.5km of vertical ascent over the cresting ridges and fern lined paths, and a further 6.5km battling the foaming waters and cresting waves of the English channel. Conditions prior to the race had been breezy, and the sea conditions expected to be rough. For the 65+ pairs of runners assembled in autumnal morning sunshine beneath Mont Ogueil Castle, there were some delights in store in the hours ahead. Sea conditions were set to challenge all competitors during the course of the day and swimming the 8 sections of Breca Jersey, averaging close to 1km each, was not for the faint hearted. Swells grew through the day to over 2m at times, with strong tidal currents severely restricting normal swim speeds. Swim times were therefore generally doubled, double the time to be subjected to the washing machine of waves and wind, double the time to avoid sharp rocks and cramping muscles. Jellyfish were out in force for the party, fortunately for most of the time floating serenely like aquatic ghosts 1 or 2m below the surface, apart from the half metre monster who decided to whack me in the face. Entries and exits to the swim legs, described as “technical”, were unashamedly hazardous at times, requiring athletes to scale cliff faces, move over slippery surfaces, and time death-defying jumps into ebbing swells in order to avoid threatening rocks. Swimming out across large bays under slate grey skies amid these conditions required a certain degree of confidence, despite the flotilla of excellently organised safety boats. Challenging swim conditions were the order of the day. World class organisation was a theme of Breca Jersey. Water safety crews lined all swims, expertly monitoring lines of swimmers in what might have otherwise been prohibited conditions. Check Point crews spread out over the entire island provided much needed hydration and sustenance to all athletes, handed out with a smile and words of genuine encouragement. And a welcoming crew manned the finish line to welcome home each and every team. These crews added to the strong sense of camaraderie that pervaded the event, a function of teams who were there for each other. It wasn’t all about swimming of course. The course comprised two distinct halves. A first half with a regular mix of swim and run, short run distances through sunlit woods and a good concentration of swimming. This mix however changed at the “sprint” race finish (16km running, 4.5km swimming), and the run sections lengthened out including one of over 10km and another of over 20km. The longer run section, in itself a half marathon, covered the western side of the island, a vast beach, hell’s beach, a vast sand filled landscape that at low tide appeared to be the surface of the moon. For those that have not experienced the pain of long term fatigue, or have never “hit the wall” in an endurance event, the feeling is hard to describe. There is a numbness to the reality that transcends everything and gradually erodes the ability to move. My strengths in the swim, leading and sighting my partner Kevin through the waves, now subsided to his strengths in ultra distance running as he cajoled, inspired and sometimes literally dragged me through the later miles. We both had our crucial parts to play in this partnership. In the golden glow of an autumnal late afternoon, we finally arrived in Portelet bay to sight the finish. The last short stretch of swimming was perhaps the most difficult of the lot, 400m feeling more like 4,000m with the rush of an outgoing tide and strong currents preventing much in the way of forward movements. A short dash up a cruel finishing set of steps, released exhausted athletes into the welcoming embrace of the Portlet Inn and much needed refreshment. I have rarely experienced in a race the kind of feeling we had at the finish of the Breca Jersey Swimrun — a shared sense of accomplishment at overcoming a mighty challenge, a challenge that despite the temporary misery and suffering on “punishment beach” had also been a spectacular and enjoyable day. It seemed much less important that we had actually finished in 7th position — an amazing result in our first effort — I was perhaps relieved as much as excited to be at the finish. I had fulfilled my contract to my partner, and together we had made it to the finish. We were as happy for those teams around us, as they were for us. “History resists an ending as surely as nature abhors a vacuum; the narrative of our days is a run-on sentence, every full stop a comma in embryo”*. There are many lessons to take from this experience — the full stop to Breca Jersey is undoubtedly a comma to my Swimrun career. Directors race report is available here. Sign up for next year’s event (in due course) here. Full gallery of photos from the day here.